The American Shorthair is America’s own breed of cat. Documentation indicates that these cats first arrived aboard the Mayflower. On board ship these cats served primarily as rodent control in an effort to stop the spread disease to humans and preserve the ships food supply that the rodents thrived on. For centuries these working cats flourished along with their pioneer owners in the New Land and eventually establishing themselves as the North American shorthaired cat. During the early part of the 20th Century, foreign breeds of cats were introduced into North America. These cats began breeding into the naturally pure bloodlines of our “Native” shorthairs, resulting in Longhairs and Siamese types of cats to appear on the streets. People who admired the qualities of the native shorthaired cats, wished to preserve them. By acquiring the finest examples of the breed at that time and then selectively breeding them our breed, the American Shorthair, was preserved. Originally known as the Domestic Shorthair, the name of the American Shorthair was chosen to represent the breed in 1966. American Shorthair breeders have constantly had to battle the public confusion between our purebred cats and the “alley cats” which is the product resulting from a mixture of indiscriminate mating. By chance, a non-purebred cat can resemble a purebred American Shorthair, just as a street cat might look like a Siamese or a Persian. The test however, lies in whether that animal can uniformly produce kittens with the same type and temperament as only a purebred can do. The ideal appearance of an American Shorthair should be of medium to large size. Heavy build indicates tremendous power. A brawny body with a broad chest, heavy shoulders, and thick hind legs are desirable. Mature males are significantly larger than females, weighing eleven to fifteen pounds. Females weigh eight to eleven pounds at maturity. The coat should be short, hard and dense. An oblong head with a full-cheeked face and wide set ears allows plenty of space for markings. An open, sweet expression is the first impression of this breed of cat. American Shorthairs are known as the cat of many colors. They come in over eighty different colors and patterns ranging from the classic tabby pattern with it’s bold distinct stripes and swirls to the mackerel tabby pattern with pencil-like stripes down the sides of the body. Also solids, bi-colors, calico, shaded and tabby & white are recognized. Its personality is gentle and compliant. Smart, and an agile athlete, it’s loud purrs, but tiny meows are persistent. 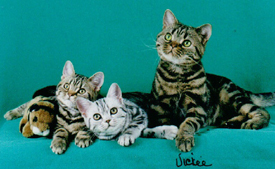 American Shorthairs can live up to fifteen to twenty years, requiring only annual vaccinations and routine veterinary care. Extremely affectionate, the American Shorthair is a great lap cat, if you can tolerate the weight. It is easily disciplined and trained, and can live with other pets including birds. Most will accept roughhousing from children and come back for more. Undoubtedly, American Shorthairs make exceptional pets and welcome additions to any family, suiting any lifestyle. 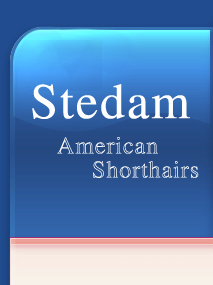 Copyright (c) 2014 Stedam American Shorthair Cattery. All rights reserved.